Episode 47 – Testing and Optimization with Eric Hansen | Beyond Web Analytics! Join Adam and Rudi as they talk with Eric Hansen, Founder and CEO of SiteSpect. The groups dives right into the need for testing and optimization and the issues that companies tend to struggle with. The group also provides some insight on where you can go to learn more about optimization and some of the the mistakes that companies make when starting a testing project. Eric is the founder and CEO of SiteSpect, and the chief architect of the firm’s non-intrusive technology for multivariate testing, behavioral targeting and digital marketing optimization. Eric is a frequent speaker at conferences covering web analytics and optimization, and writes regularly on topics dealing with the intersection of marketing and technology. He received his B.A. in Cognitive Science and Psychology with honors from the University of Rochester in Rochester, NY. 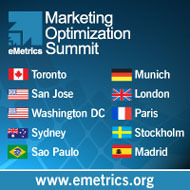 This article was posted in Podcasts, Web Analytics and tagged Optimization, SiteSpect, Testing. Bookmark the permalink. Follow comments with the RSS feed for this post.Post a Comment or leave a trackback: Trackback URL.